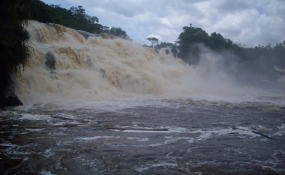 Wongan Waterfall, Kokoyah, Bong County, central Liberia. There are three strategic sectors that if our current government can invest heavily in with immediate effect we can become a middle-income country within the next two decades. Those key sectors are Education, Agriculture, and Tourism. For my interest, I am going to focus on the benefits that Liberia stands to reap if the right investments and policies are implemented in the tourism sector. I will leave the Educational & Agricultural sectors with the experts to deal with them. Firstly, before I elaborate on what Liberia stands to benefit if we have a vibrant tourism sector, we need to briefly get a clear understanding of what tourism is, what impact it has on global trade, Liberia's tourism potential, and how tourism has lifted poor countries out of poverty. Tourism can be defined causally as the travel for leisure or business. It is one of the biggest industry in the world and the sector generated 1.8 trillion in the year 2017 and out of this amount, Africa generated 20-billions. The tourism sector has employed more than 70 million people worldwide and it is a sector that experts at the World Tourism Organization (UNWTO) predicted to continuously grow. Liberia possesses a rich culture, history, great biodiversity in fauna and flora, the most beautiful waterfall and lake in the tropics. More to that, we have 350 miles of uninterrupted coastline, some of the most endemic species in the world, and having one of the best surfing spot in the world. The tourism sector with its huge potential can generate billions in revenue for the government and at the same time create thousands of jobs for Liberians both in the private and the public sectors. Tourism is a powerful tool that has been used by very poor and underdeveloped countries to advance their own development. For an example; Cape Verde was able to use tourism as a development tool to lift itself from a poor and least developed country to a developing country and Liberia can take lessons from them to develop. It is not late to start now because there is a workable blueprint for the tourism sector, which was drafted and sent to the 53rd Legislature for passage into law two years ago under the Presidency of Madam Ellen Johnson Sirleaf and the leadership of Hon. L. Eugene Nagbe as Minister of Information Culture & Tourism. The name of this document is named and styled "Liberian National Export Strategy on Tourism 2016-2020". Some of the key drafters of the Liberian National Export Strategy on Tourism 2016-2020 are still around and some are still holding strategic positions in the current government and the private sector. With specific e being placed on those could advise the government on the importance of implementing this policy to the letter. Tourism places money directly into communities that are directly affected by tourist's visits. With a clear understanding of what tourism is, we will now focus on five key benefits that Liberia stands to benefit if we invest in the tourism sector. We are currently experiencing serious economic crisis and huge unemployment rate in the country. The pains, hardships, and embarrassments of unemployment are being felt more by the youths of Liberia. A vibrant tourism sector will help employ thousands of youths and eliminates this national crisis. Those that work directly in the sector like, hotels, restaurants, resorts, guest houses, tour guides, aviation, and car rental companies will employ more people due to the influx of tourists and it will also indirectly affect other sectors like agriculture, the arts sector, and retailing businesses positively. When tourists visits a country they put money directly into the local economy by their spending. Tourists purchase food, clothing, paid hotels bills, buy tourist visa, do hairdressing, use local GSM companies, and use local transportations services which in term boost the economy. The money that is spent by tourists, the revenue generated by both individuals and businesses from tourists is injected directly into the local economy. So more money is earned locally from tourism and those monies are spent in the local economy and that helps to eradicate poverty. The revenues generated from tourism are usually referred to as having a multiplier effect because a huge percentage of every tourist dollar earned is reintroduced back into the economy over and over again. This means, with the right programs that will attract tourists to Liberia means they will be coming with their tourist money and those monies will have a direct economic benefit for all our citizens. It is a fact that our government over the years has been overly dependent on the mining sector. When the prices of those minerals plummet on the world market we experience constant budget shortfalls and the economy starts to experience negative growth. We could limit or get rid of our over-reliant on the extractive sector by investing more in tourism. A vibrant tourism sector with a constant inflow of hard foreign currency could serve as a cushion to absolve the shock that our government usually experience in her revenue generation when the prices of our major export commodities falls on the world market. As more tourists visit a country and in order to maintain their inflow the government and private businesses will have to build better facilities around tourist sites, build new airports to receive tourists, new roads to tourist sites and better hotels to accommodate them. Projects such as hospitals, schools, public libraries, and museums can be built and operated from the extra cash generated from the sector. Eco-tourism has the ability to maintained Liberia status as a biodiversity hotspot, safe our forest from deforestation and at the same time generate huge revenue from tourists, researchers, and academicians that are interested in the ecosystem of Liberia and also for those that love nature. Taking into consideration that 42% of the remaining upper guinea rainforest in West Africa lies within our borders gives us a competitive advantage to become a major player in the eco-tourism market globally. With a clear understanding of what we stand to benefit as a nation if we invest in tourism, the following recommendations need to be implemented immediately if we are to become a tourist destination and also create another source of revenue for the government and private businesses. If these recommendations are listened to and implemented by our leaders, we can rest assured that our beloved country will be on the right path to total development and the pro-poor agenda of this government will be met to the fullest. Saytarcon W. Tipayson is a Sales & Marketing Specialist by profession. He is the founder and CEO of SPARKA Tour & Guide Company. He is a Liberian who hails from Putuken, River Gee County and a graduate of the College of West Africa (CWA). He holds a BBA Degree in Management from AMEU (Honor), a diploma in Insurance and Risk management from Cusworth International Business School, a certificate in new product development from Continental Re-insurance (Nigeria) and a certificate in Public Procurement from Liberia Institute of Public Administration (LIPA). He is very passionate about tourism and intents on building and operating Liberia's first premiere tourism Institute and Incubator center for those desirous of venturing into the tourism industry. He can be contacted at email: [email protected] or reach on mobile (231) 0881271408 or 0778553093.